The Saudi-led coalition stopped a UN flight to fly from Djibouti to Sana’a, Yemen, because of security concerns. The flight was to carry an aid agency staff to the rebel-controlled city and also had three journalists from the BBC onboard. The Saudi-led coalition controls the Yemeni airspace. A source from the coalition said the UN is “not concerned with transporting journalists, except those who are coming to cover its own activities.” The source also added the official point of entry for civilians is the Aden airport, under the control of the Hadi-led government. It is unclear if the journalists had visas or not but the source underlined that foreigners must have visas issued by the Yemeni government and travel on commercial flights to Aden. The Saudi-led coalition began its military operations in March 2015 with the objective of reinstating Hadi as the legitimate president of the country. Progress on the ground has been slow since mid-2016 amid increasing hunger, poverty, disease, and lack of basic amenities. A recent cholera outbreak has worsened the situation. 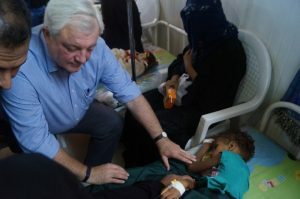 However, a statement released by the Hadi government and published by Saudi Press Agency alleged that the rebels are using the visit as a cover-up of their efforts in “propagating their destructive project through humanitarian stories, manipulating catastrophic conditions of the Yemeni people” living under difficult conditions and “western media finds fatty stories to present to its audience.” It also urged journalists to refrain from being used as propaganda tools by the rebel group. Written by: Peter Mulvany on July 19, 2017. Posted by Peter Mulvany on Jul 19 2017. Filed under Gulf News, Headlines. You can follow any responses to this entry through the RSS 2.0. Both comments and pings are currently closed.